More than $8 million in high value goods and services donated by corporates have reached thousands of people affected by the Black Saturday bushfires in Victoria. More than one year after donations started flowing to survivors of the Black Saturday and Gippsland bushfires, more than $8 million of corporate donations of high value goods and services have been distributed, according to the Victorian Bushfire Reconstruction and Recovery Authority. The Authority says the availability of these high value donations has come to an end after thousands of domestic flights, intrastate and interstate holidays and store vouchers and electronic and whitegoods were distributed on a needs-basis. The Chair of the Victorian Bushfire Reconstruction and Recovery Authority, Christine Nixon, has thanked the hundreds of corporate donors who contributed to the relief effort. Nixon says thousands of offers of donations came in after the fires and have continued to do so including animal agistment, horse riding equipment and donations of IT equipment and services, free trades and supplies such as carpentry, earth moving and building services. Nixon says the Authority has spent much of the past year matching donations to needs identified amongst individuals and communities, with a ballot and points system developed to evenly share the high-value donations amongst survivors of the fires. High value donations have included Qantas and Virgin Blue domestic flights, intrastate and interstate holidays arranged through Tourism Victoria, store vouchers to the value of $500 from stores including David Jones, IKEA and Best and Less and product packs from Panasonic and Tupperware. Christine Nixon says the donations have been just one part of the package of assistance made available to help bushfire-affected individuals and families get back on their feet, coming on top of material aid for essential items and a wide range of grants through governments and the Victorian Bushfire Appeal Fund. 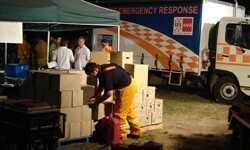 Nixon says the corporations who donated these goods and services made the lives of bushfire survivors a little easier. She says the goods and services were distributed equitably through a ballot and points system, under which more than 6,000 affected households could access high-value donations according to their existing needs. She said VBRRA would continue to work with the hundreds of other corporate, philanthropic and Not for Profit donors who had combined to pledge almost $25 million in cash for community-focused projects. The contributions have supported projects including the establishment of the Kinglake Ranges Business Enterprise Network hub, kitchens at the temporary villages, the Rebuilding Advisory Centres being built at Marysville and Kinglake and many more recovery-focussed projects. Organisations which have provided significant funding for local projects include Rotary International, Rete Italia radio station, the Indonesian Government, the Foundation for Rural and Regional Renewal, the Bendigo Bank Community Enterprise Foundation, McDonalds, BlueScope Steel, Lions Club, The Salvation Army, Metricon, Simmonds Homes, Australand, Pandora, Tzu Chi Foundation, the Greek Government, the Helen Macpherson Smith Trust and Darley Australia among others. Nixon says the Authority will continue to work closely with local Community Recovery Committees in matching local projects to remaining funding from donors. Material aid, consisting of mainly second-hand goods including clothing and household wares donated in the immediate aftermath of the fires, continues to be distributed to bushfire-affected people. As items of material aid continue to run down at Clayton, VBRRA will open the warehouse on two Saturdays this month to help distribute the remaining goods. The Clayton Warehouse will be open from 10am to 2pm on Saturday 20 and 27 March for those wishing to access material aid. With all remaining stock expected to have run down by late March, the warehouse will close in April – with any remaining stock of second-hand clothing sent out to regional distribution points at Marysville and Pheasant Creek or to the Salvation Army and St Vincent de Paul. Blue referral card holders can access material aid from the following locations: the Kinglake Neighbourhood House, Marysville, Pheasant Creek, Hurstbridge Relief Centre and Diamond Valley Baptist Church. The Salvation Army still have relief centres operating in Whittlesea and Traralgon.